While at first glance, the ABLLS-R seems like quite a daunting task to undertake, in the long run it makes life SO much easier in SO many ways!! When working with students who have disabilities, especially autism, we often have difficulty understanding why they can't get to that "next step". We know that students with disabilities often need extra steps between the steps that make up typical developmental progress, but it isn't always obvious what those bridging steps may be. 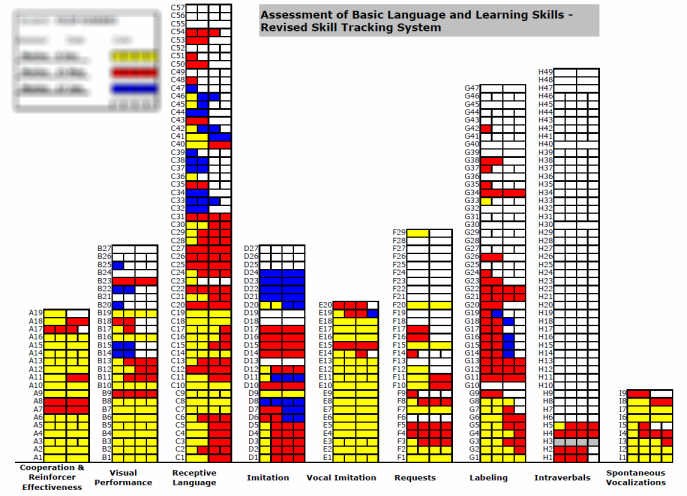 The ABLLS-R breaks down practically every skill that you can think of into smaller steps and makes it easier to see where that "disconnect" is between what the child can already do and what the next "typical step" is. Then we can teach those in-between steps and help the student get to the next big step. It practically writes your present levels or performance as well as IEP goals/objectives which are specific, measurable, attainable, and are directly related to the PLP! One of my very favorite parts of the ABLLS-R is that it visually shows the progress that a student has made from year to year on the tracking form in the front of the book. This is very helpful in IEP meetings, to show parents "Everything you see in blue here is something Johnny was not able to do last year but can now do". This gives the parents (and other IEP team members) a very clear overview of the progress a student has made across all domains. Different Roads to Learning sells a kit with all of the materials needed to complete the ABLLS-R - the kit comes either with or without the assessment manual and protocol. They also have most of the materials in the kit available for purchase outside of the kit - because many classrooms will already have materials for several of the sections. VB Teaching Tools also sells a kit as well as separate materials. Autism Concepts has a set of 392 color coordinated and indexed ABLLS-R Skill Cards to aid instructors in teaching the ABLLS-R skills. Navigation Behavioral Consulting has several posts about "Understanding the ABLLS-R"
What are some of your favorite resources for using the ABLLS-R in your classroom?